Unless you’re part of the 1% who has a standing desk, you’re likely shifting in your office chair for 40+ hours a week. An uncomfortable chair, coupled with the everyday stress of getting your work done, is likely putting tension in your back, your shoulders, your neck… It’s time to take a deep breath. Give yourself a few minutes to try some of the following easy desk stretches below to help you ease that tension. Incorporate some yoga into your work day with a seated version of the Cat and Cow poses. Seated with your hands on your knees, arch your back, pull your shoulders towards each other behind you, and lift your chin (cow pose). Hold the position for a few seconds, then transition to the cat pose by rounding the spine, pulling your shoulders towards each other in front of you, and curling your chin into your chest. Repeat the cycle 8-10 times to open up your torso and stretch your back, neck, and shoulders. Relieve the tension in your neck by relaxing your muscles and leaning your chin forward. Roll your head gently from shoulder to shoulder. Repeat 3-5 times. Avoid headaches by taking the time to release the tension in your neck and upper back. Sitting up straight, place your hand on your head and gently pull your head towards your shoulder until you feel a gentle stretch. Hold this position for 10-15 seconds before releasing. Repeat on the other side. Alternatively, grip the side your chair with your right hand and gently pull as you tilt the head to your left. You should feel a stretch down the right side of your neck and shoulder. Hold for 10-30 seconds and repeat on the opposite side. You probably already do overhead stretches without realizing it! Interlock your fingers over your head and press upwards, holding for a few seconds before releasing. 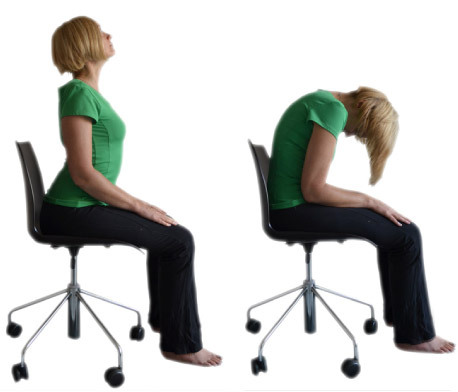 To add a reach to stretch out your sides, sit straight in your in chair and stretch your right arm over your head. Gently lean to the left until you feel a stretch in your right side. Hold the position for 10-30 seconds and repeat with the left arm over your head. This exercise is an easy way to reduce lower back pain, and it’s one that you might already do without realizing it. Sitting tall with both feet on the floor, use your right hand to reach behind you for the back of the chair. Gently rotate the torso to the right, keeping your back straight and your hips square to the front. Hold for 10-30 seconds and repeat to the left. Unless you have perfect posture, you’re probably reading this hunched forward. This exercise is a great way to straighten that back and stretch it out. In a seated or standing position, extend your arms behind you, clasping your hands together if possible. Stretch the arms and gently lift them until you feel a stretch in your chest. Hold for 10-30 seconds. This exercise does put strain on your shoulders, so avoid it if you have any shoulder issues. Get the feeling back into your numb legs by extending them forward until they’re stretched. Flex your feet and relax forward, reaching for your toes. You should feel a deep stretch behind your legs in your hamstrings, plus the position will help stretch out your back. For a stretch that gets you up and out of your chair, stand a few feet away from your desk or chair and lean forward until your torso is parallel to the floor, using the back of your chair or your desk for support. If that’s still not enough for you, relax all the way forward and put your hands on the floor or on your feet. Relieve the tension in your hips and glutes with this seated exercise. Sitting straight in your chair with your left foot on the ground, cross your right ankle on top of your left knee. Keeping your back straight, gently lean forward until you feel a stretch in your hip and glute. For a deeper hip stretch, gently press down on your right knee. Hold for 10-30 seconds and reverse the exercise. Typing all day can leave you with tense wrists and forearms, but they’re easy muscles to forget about. Extend your right arm forward with your wrist facing up, extending your fingertips downwards. Use your left hand to gently pull your hand back towards you. Try it standing by placing your palms on your desk with your fingertips facing you. Lean forward for a deeper stretch and feel all that tension release. Being seated all day forces your hip flexors to tighten. While we all hate lunges at the gym, they’re actually a great way to bring your hip flexors some relief while also getting you up and moving. (They’re also a good excuse to wear leggings to work!) While standing, step your right leg behind you and bend both knees until you feel a stretch at the front of your right hip. Hold for 10-30 seconds and repeat on the other side. For more health and wellness tips, check out these 8 ways to stay healthy and motivated at the office.